The Green Solar Cities, EU-Concerto project focuses on the practical large scale implementation of solar energy technologies in combination with new build and retrofit low energy building in the cities of Copenhagen, with its city part Valby, in Denmark and Salzburg in Austria. 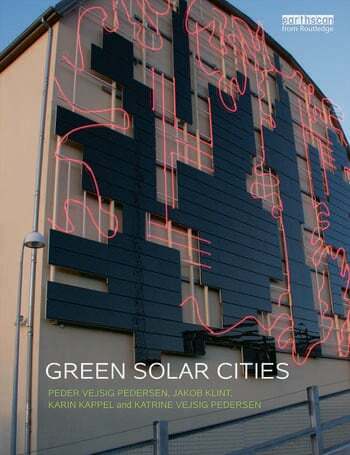 This book aims to influence decision makers in European cities towards a similar approach to the Green Solar Cities project, in close cooperation with leading building component suppliers, energy companies and engaged builders also working with local city officials. This book will benefit those in a situation where many cities aim at a "Smart City" development, but without clear policies of how to achieve that in practice. In Denmark there are similar policies, with an overall aim to be CO2 neutral by year 2025 in the city of Copenhagen. However, there is still a lack of understanding concerning, how solar energy as the world’s number one energy source can play a major role here and how this can be combined with energy efficiency policies, use of district heating and combined heat and power. The general aim is to introduce the international "Active House" standard and work on "Active Roofs" of the future. The connection between solar energy and low energy building and energy renovation is aimed to be ensured by help of the "Active House" standard which has been developed in cooperation with a number of leading building component manufacturers in Europe. Green Solar Cities is published on the basis of the EU Concerto funded project, Green Solar Cities, with Valby in Copenhagen, Denmark and Salzburg in Austria as the main city partners. Peder Vejsig Pedersen is the Technical Coordinator and initiator of the Green Solar Cities project and has an MSc in engineering. Peder is also the Director of Cenergia and has been Chairman of the Danish Association of Sustainable Cities and Buildings (FBBB) since 2005. Jakob Klint is an Administrative Coordinator of the Green Solar Cities project and Project Leader at the Kuben Management organisation, Denmark. Together with Peder Vejsig Pedersen he initiated the Valby PV plan in 2000. Karin Kappel is an Architect MAA from Denmark and has been the Secretariat Leader of the Solar City Copenhagen association since 2004. Katrine Vejsig Pedersen has an MSc in engineering. Her main focus is on sustainable organisation and planning in communities.